The election of a Danish Venstre (liberal) minority government led by PM Lars Løkke-Rasmussen is setting Denmark on a collision course with Russia; a course that promotes NATO’s expansion, and the continued State / NATO sponsorship of terrorism. Recent parliamentary elections in Denmark resulted in the formation of a minority government led by Prime Minister Lars Løkke-Rasmussen. His liberal Venstre party came in third while Social Democrats continues to be the party that hold most votes in parliament without having a majority. Løkke-Rasmussen’s minority government will have to rely heavily on cooperation with the populist right wing Dansk Folkeparti (Danish People’s Party). 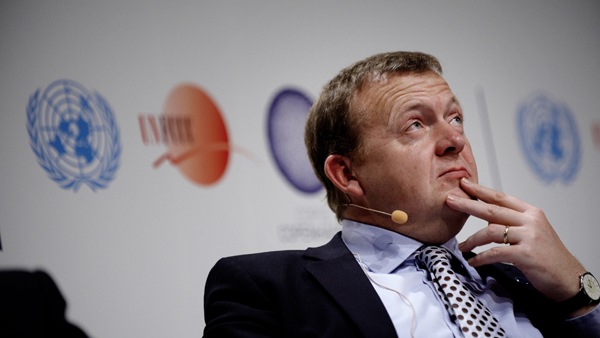 Lars Løkke-Rasmussen’s sponsorship of terrorism. One should notice that former NATO Secretary-General Anders Fogh-Rasmussen is a member of Løkke-Rasmussen’s Venstre. The functions within NATO are clearly defined. The Supreme Allied Commander Europe (SACEUR) has always been and will most probably always be a US citizen. A Secretary-Generally is being chosen with the intent to further NATO’s political agenda. The election of Stoltenberg to the office suggests that NATO will continue to use the Scandinavian countries close ties to the Baltic countries, to Poland and by extension to the Ukraine, to further promote NATO’s eastwards expansion. Adding Lars Løkke Rasmussen and a Venstre government that depends on the Danish People’s Party into the equation is more than likely to contribute to worsening Scandinavian – Russian relations. This is also likely to hold true with regard to Finland; A subject that is so complex that it would warrant an entire article. A confidential conversation with a Major (name and identity known to the author) who is serving within Denmark’s paramilitary Hjemmeværnet (home-front-defense) added an additional and disturbing perspective to Lars Løkke-Rasmussen and his Venstre government. Quote: “If you want to investigate NATO’s stay behind network in Denmark begin with Lars Løkke and other key Venstre members”. The Major’s statement confirmed what former WW II resistance fighter, sole survivor of her resistance groups and lifelong honorary member of Denmark’s Parliament, Dr. Eva Graungaard had stated to the author before. All Danish Parties that are represented in the current parliament, with the exception of Enhedslisten (Unity List) support Denmark’s acquisition of new fighter jets for Denmark’s air force. Members of Venstre repeatedly stated that Denmark should live up to its responsibilities with regard to “securing the air space over the Baltic Sea”. It is within this context that the alleged near-mid-air-collision between a Russian military jet and an “unspecified” Scandinavian passenger jet in December 2014 becomes particularly interesting. The alleged near-mid-air-collision purportedly happened immediately after the passenger jet’s takeoff from Copenhagen Airport, where-after the jet entered Swedish airspace. The author has filed a freedom of administration request with Swedish Air Traffic Control (Luftfartsvärket LFV). Requested are, certified copies of radar data, a certified copy of the report about Luftfartsværket’s internal investigation of the alleged incident, copies of all correspondence LFV has about the incident, including correspondence to national and foreign ministries as well as to and/or about NATO. Two weeks ago the author was promised to receive the requested documentation; even though LFV spokesman Per Fröberg would state that it could take some time and that much of it would probably have to be heavily redacted. The Danish word “Lykke” means “joy or bliss”. The word “Løkke” translates into “noose”. Considering the increased tensions between NATO and Russia; Considering the conclusions of a Symposium on the risk of nuclear extinction and the risk of unwanted nuclear war, held at the New York Academy of Medical Sciences. Considering that experts warned that the risk of an unwanted nuclear war is today greater than it was during the Cuban missile crisis; One can conclude that adding a life-long sponsor of terrorism as Danish PM into the equation is not reassuring for Russia, for Denmark or for the world as a whole. It’s a noose around the neck of peace rather than blissful and peaceful coexistence.